The Big Idea: When the people in their lives have honest communication, kids thrive. Kids benefit when the people who are most involved in their lives and learning share information and have meaningful communication. Begin a discussion with childcare providers about things they already do to establish strong relationships with parents. 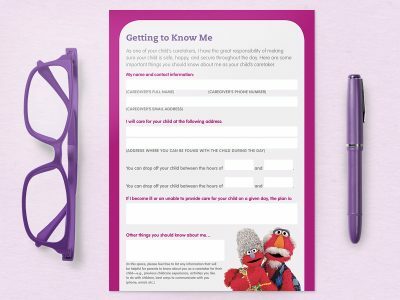 How do you normally introduce yourself to parents of children in your care? What information do you share about yourself and your caregiving experience? What are some things parents usually want to know about you or about their child’s care experience before they leave children in your care? What do you typically ask parents about their children’s needs, behavior, personality, or learning level? How do you update parents on children’s learning? Regroup, and end the session by asking caregivers to share ways that they get support and advice about setting up positive relationships with parents, and sharing their childcare practices, philosophies, and routines.